RIO DE JANEIRO – “There’s something really powerful about the energy put out by big a band full of horns and drums” says Tim Malik, a Rio-based musician from New York, as he waits for all his band mates from the brass bloco group Orquestra Voadora to arrive at Praça São Salvador in Laranjeiras before they set off for a show. Orquestra Voadora play their annual Independence Day Parade this weekend, photo by Tiago Facina. 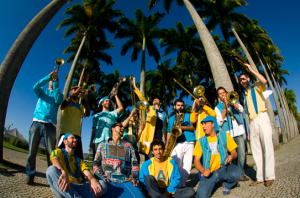 Over the last two and a half years, Orquestra Voadora (The Flying Orchestra) have built a cult following with a mix of tight musicianship, Brazilian beats and pop classics, creating the party wherever they play. With all fifteen members blasting the brass or driving the rhythm on their unique interpretations of songs by Michael Jackson, Madonna and Os Mutantes, a euphoric dancing frenzy often surrounds their performances. From here the band started rehearsing together and playing shows on the streets and squares of Rio. 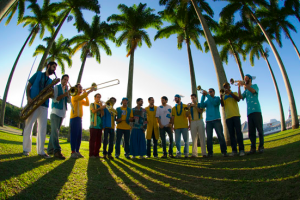 According to saxophonist André Ramos, this bloco spirit of unity between the band and the followers is an important part of their performances. “I don’t like this thing where there’s an idol on stage and the fans separate” he says. “The crowd really give us energy”. Leonardo agrees, “It’s like an exchange. I don’t think the audience realize how much their energy contributes to the performance”. Their raw, combined force of four trombones, four trumpets, one baritone sax, one tuba and five percussionists pumping out hit after hit, from disco to pop to samba to rock to their own compositions, is quite irresistible. The rousing fanfare of a traditional brass band blended with pure samba party spirit invigorating classic tracks like Billie Jean, Jungle Boogie and Day Tripper guarantees a bouncing, dancing swarm. In just two years the orchestra have become a huge draw in Rio, and plan to tour Brazil soon, photo by Tiago Facina. Today the band, distinct from the larger bloco who rehearse every Sunday at the Museu do Arte Moderno (MAM) as an open jam, are doing a show for children’s medical NGO Doutores da Alegria in Jacarepaguá. Members arrive all hugs and cheery banter, evidence of the camaraderie that emanates while they perform. As Tim, the tuba player of the group, says, “The members of the band have a lovely positive energy that gets pushed out and amplified by these crazy instruments”. Playing shows and street performances all year round, the band have achieved some ambitions (“it was always my dream to play at Circo Voador” says Leonardo) and having thus far performed predominantly in Rio de Janeiro state so far, the group now have their sights set on a tour. But before any of that there’s a busy Spring schedule of shows starting with their annual performance for this week’s Independence Day holiday. “It’s Independence Day but our show celebrates interdependence, because everyone relies on one another,” explains Andre. This year it will be part of the bonde’s birthday celebrations in Santa Teresa on Saturday September 4th, with the bloco setting off from Largo das Neves after 6PM. And then next week on Tuesday, September 7th, the band will perform as part of the fourth Festival CineMúsica in Valença, Rio de Janeiro state. For more information on forthcoming shows visit www.orquestravoadora.com.br or the group’s Facebook page or Twitter. I’m Juliano , Orquestra Voadora’s trombonist and i would like to invite you to the first day in cinema of my movie with Orquestra Voadora called “Para o alto”, next friday, 29/10, at 20:30 in Cine Santa, Santa Teresa, Rio de Janeiro.